Fishing on Eagle Lake, Ontario is what a Canadian fishing trip should be all about. It is truly rare to find all five major species on the same lake, Eagle Lake has them all! Walleye, northern, musky, smallmouth bass, and lake trout are all within easy reach from the lodge. With over 68,000 acres of clear Canadian Shield waters, more than 100 islands, and in excess of 400 miles of shoreline, Eagle Lake offers very good fishing. Walleye fishing on a Canadian lake is what memories are made of. The Ministry of Natural Resources considers it to be one of the top walleye lakes in northwest Ontario.There are several good reasons for this assessment. Eagle Lake’s healthy walleye population has had the benefit of almost 20 years of innovative fisheries management practices. A slot size (all walleye between 18-23 inches must be released) implemented years back has resulted in a stable & robust spawning population. Combined with a restriction of only one fish over 23 inches in a “limit”, no night fishing, and a catch & release philosophy amongst many of today’s anglers, the result is a quality fishery here on Eagle Lake. Unlike some lakes where the fish seem to be from the same cookie cutter, on Eagle one never knows whether the next fish will be 17 inches or 27 inches! Northern Pike are abundant and offer the trophy hunter as well as the junior angler in the paddle boat a chance to feel the thrill of that bent rod and screaming drag! For anglers looking for fast action this is the species to target. Hard fighting and seemingly always eager to bite, pike are numerous in Eagle Lake. 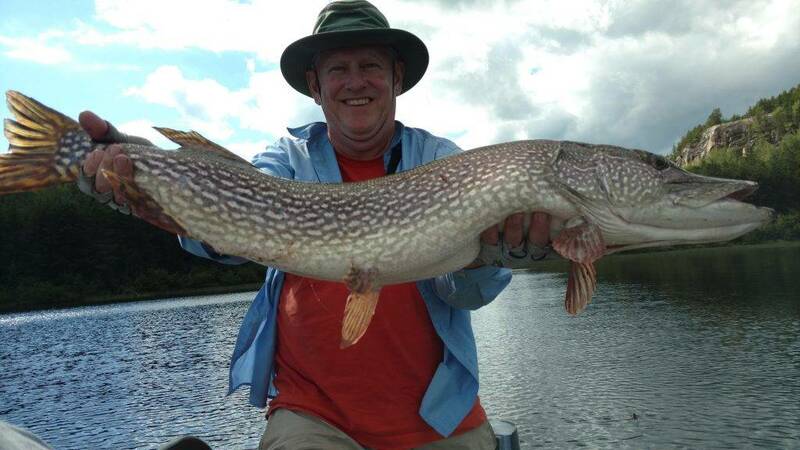 Pike in the 24-27 inch range are common, and are the best “eaters”, with bigger fish pushing 40 inches and over being caught throughout the season. All lakes in northwest Ontario have a protected slot size for pike of 27 ½ to 36 inches. These fish must be released. The result on Eagle has been impressive with the number of quality pike growing exponentially. Targeting these fish with surface baits, spinners and crankbaits has produced some very thrilling catches in recent years. Musky is the king of freshwater fish and are a fun challenge for both novice and pro alike. Eagle Lake is the only lake in N.W. 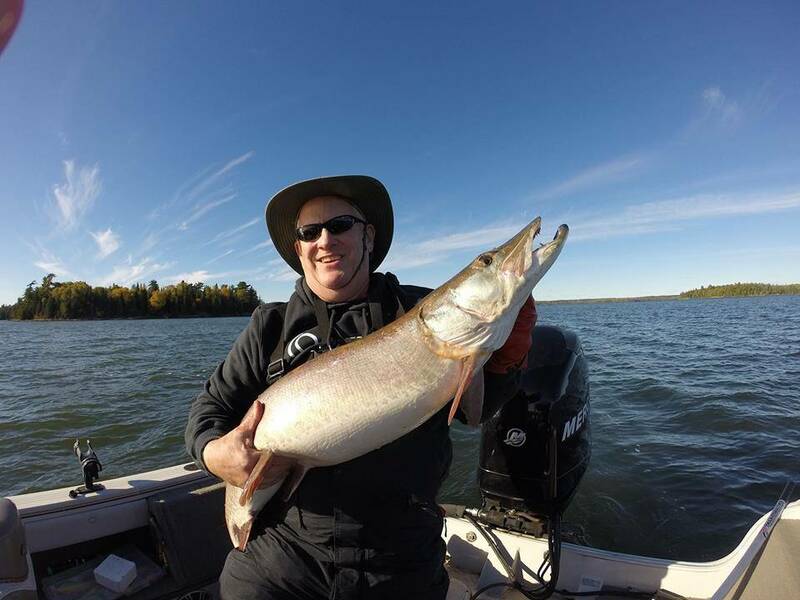 Ontario to have two recorded musky over 60 pounds, one being caught right here in Vermilion Bay! A trophy hunter’s paradise! Eagle Lake has been the destination for generations of serious musky hunters. The Ontario Ministry of Natural Resources has classified Eagle Lake as a “trophy musky fishery” and has enacted innovative fisheries management tools to protect, and enhance its musky population. A 54 inch minimum size limit, plus a well established catch & release philosophy, has ensured Eagle Lake’s future as a trophy musky destination. This is a totally natural fishery; no stocking of musky has ever taken place. Eagle Lake contains the spotted strain of musky with the occasional naturally occurring “tiger” hybrid. Over the past ten years, we have seen a significant increase in the number of immature musky roaming our waters, a sure sign that the management plan is working. Skillful anglers catch 40 to 50+ inch fish each year. Many serious musky anglers and fishery biologists believe that Eagle is home to monster fish in excess of fifty pounds. Smallmouth Bass are the ultimate scrappers on light tackle or fly rod. Try it once and you’ll understand why! For the smallmouth angler, this is an opportunity worth noting! Some of our guests travel from as far away as Kentucky to catch these lightly pressured fish. Eagle Lake is a quality bass fishery, with an average size of 2-3 pounds. However, 4 to 5 pound fish are available and these are the ones that make Eagle Lake smallmouth fishing very exciting. Fish of this size are very strong, powerful and often put on an acrobatic display after being hooked. The absolute best time of year to target these fish, and get into consistent action is during the spring spawn. This occurs in the late May to mid-June time frame and can offer some outstanding fishing with topwater lures and light tackle. Shallow bays where water temperatures begin to warm early in the season are prime locations. And for something truly special, the lodge keeps a boat & motor on High Rock Lake and Caribou Lake. These lakes are “off the beaten path” that you portage into for arm-tiring bass action that is nothing short of amazing! Lake Trout on Eagle Lake offers the chance for a real trophy; 20 pound fish are not unheard of. Lake trout have been thriving in Eagle Lake for thousands of years. The population is well established, but considerably smaller in size than pike and walleye. But anglers who know what to do and where to do it have been catching them for generations. The lake trout in Eagle have seasonal movements. We have had great success fishing within site of camp on many occasions early in the season. Lake trout on Eagle average in the 4-8 pound range with individuals over 20 pounds being caught each year. They are great fighters, especially when caught on medium-power tackle. When Lake Trout Fishing jigging and trolling are the methods that produce best for our guests that actively pursue lake trout. An exciting addition to the Eagle Lake trout fishing is the opportunity to access Delano Lake (Clearwater) by half mile portage trail where we keep two boats & motors for exclusive use by VBL guests. This is a numbers lake for trout where the average size is 24-26 inches. Very tasty eaters and plenty of them! 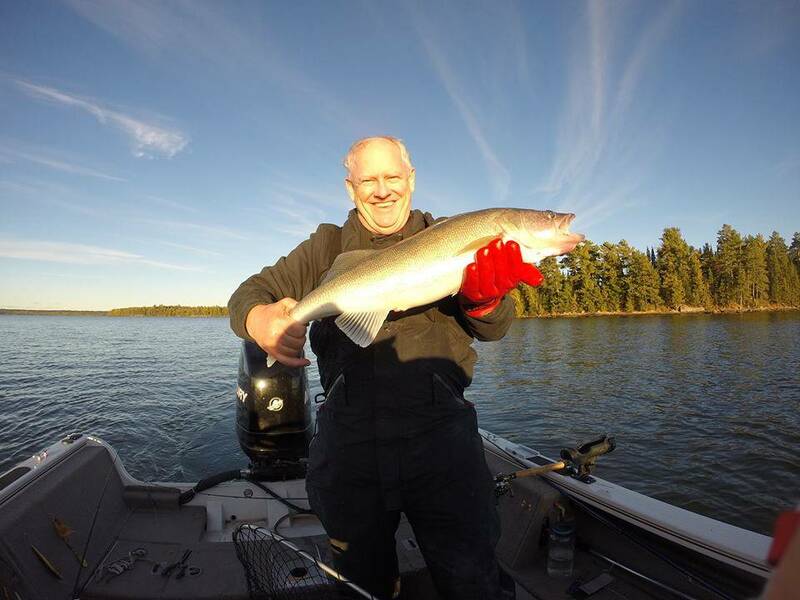 “If you’re looking for an outstanding vacation spot for the serious fisherman or a family get away you should consider Vermillion Bay Lodge on Eagle Lake, Ontario Canada. We have stayed at many lake resorts over the years, but none offer the simple pleasures of this one. The lake is large enough and holds enough fish for the most adventuresome fisherman and yet easy for local family fishing for young children. Bring your own boat or use one of the aluminum boats (20 hp) at the lodge. Boat dockage is well protected from the wind and allows easy access to the water. Fishing on Eagle Lake, Ontario is what a Canadian fishing trip should be all about. It is truly rare to find all five major species on the same lake … Eagle Lake has them all! Walleye, northern, musky, smallmouth bass, and lake trout are all within easy reach from the lodge. Download the Ultimate Eagle Lake Fishing Guide for complete tips on how to catch each species of fish!